The clavicle or collarbone is a bone in the shoulder. It acts as a strut connecting the spine to the arm. 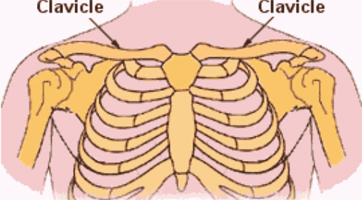 It is the attachment point for many muscles includingthe pectoralis major, deltoid and trapezious muscles. 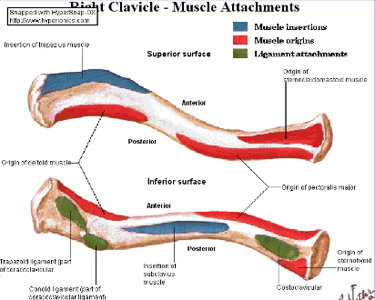 The clavicle is an s-shaped bone with joints at both ends. The medial end forms the sternoclavicular (SC)joint while the lateral end forms the acromioclavicular (AC) joint. The clavicle rotates approximately 30 degrees when the arm is raised over the head. Some individuals have a prominent clavicle, especially those that are slender. Clavicle fractures occur when people fall directly onto their shoulder. Increasing amounts of force result in more severe injuries. 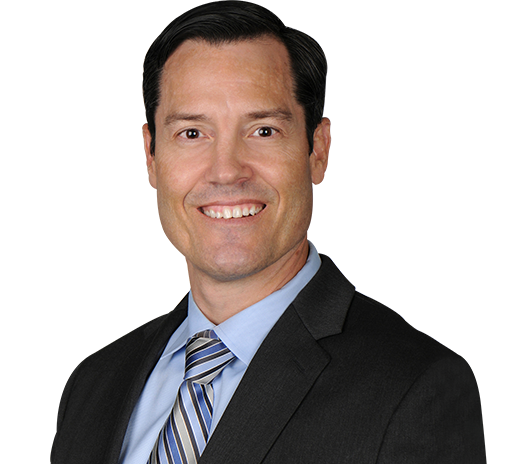 Car accidents, falls off ladders, sporting accidents all can create clavicle fractures. 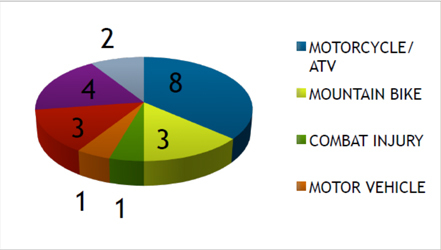 Bicycles and motorcycles are highly correlated with this injury. Typical symptoms of clavicle fractures are initial intense pain with drooping of the shoulder, inability to raise the arm. 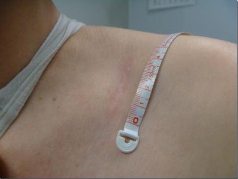 Swelling, tenderness and a deformity over the clavicle are also typical. 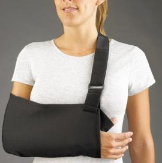 Many clavicle fractures heal readily without the need for anything other than a sling for comfort. 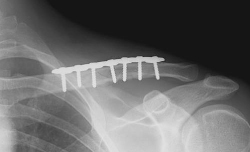 Minimally displaced clavicle fractures heal in 6-8 weeks and generally do not require surgery. 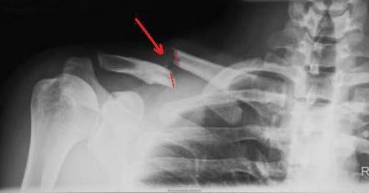 Some clavicle fracturesdo not heal orare significantly displaced and would heal in a deformed position, creating pain and weakness. Traditional repair is performed with a plateand screws. When possible, intramedullary fixation is a better option for repair because of smaller incisions, fewer potential complications, improved healing rates, and no need for routineremoval of screws. 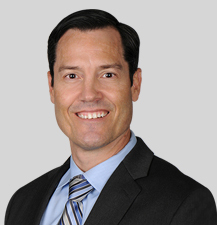 Patients remain in a sling for 4-6 weeks, and PT is not typically needed.